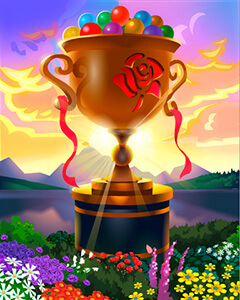 Lots of Marathons coming up: a 10-Game marathon begins February 15th (this will be the Crab Cup Marathon), then a Solitaire Gardens marathon near the end of the month. Slated for March is the Magic Marathon, followed by another 10-Game marathon in mid-March. Keep track of all of these and more on the New & Coming Soon page. The Ringmaster in Poppit Party now always holds cotton candy instead of a whip in-game. New levels and badges are available for Cookie Connect and Jet Set Solitaire. Pogo is planning new levels and challenge number 3 for A Way With Words, for release in March. A free Valentine’s Day Claire Hart: Secrets in the Shadows episode will be available tomorrow. Trizzle HD is scheduled for February 28th. Sweet Tooth Town is scheduled for February 26th. Pogo refers to this as their “biggest match 3 game ever”. Question for Pogo: Are there more Badges after a player reaches 1000 Collectibles in each rank in Poppit! Bingo? Answer: no. FYI the last Badge Marathon was Sept 18 2018 with 60 badges to complete…and 3 exta badges .. it lastly about a month… I will intersted if this like the last one we had . Actually there were 5 completion badges as long as you finished all 60 badges in time. I understood that Mahjong Garden was to be updated at the end of February, (Feb. 25th) but now it seems to be Trizzle instead. Anyone else remember it that way or am I (once again) imagining things? All the Power-Ups that you purchased in the Flash version of Trizzle will be owned by you in the HTML 5 version of Trizzle! Please note that all free Power-Ups that you have in your collection will not transfer over. Does anyone know if there is a certain # of moves that counts as a ‘game’ if you hit quit or new game, or do you have to play the game out to count…I find that trophy for 500 games rather long, and almost afraid to know how many are in the 2 after…if one needs to finish the game, I sadly won’t finish this one…I’m done all the others. You must complete at least the 30 moves it starts with and finish the game. You could just take a doll and move it up and down one space until you run out of moves, and that would count as a game. After the 500 games, it’s 1,000 games for the next trophy. You have to play out the game for those to count. If you hit quit/new game it won’t count for those missions. Ugh! So not looking for any of the upcomming marathons! So so so tired of all the marathons! of any kind. Is not fun anymore and I’m not fooled by the “Free badges” label anymore. About the only good thing in the blog is the new Valentine’s Day episode for Claire H.
And maybe also the new cities in Jet Set sol., something new to play for while working on the Winter Quest boss badge. With all that’s going on I’m so lost! Not sure anymore what events are “On” and when they end! Gonna have to start a spreadsheet or something. Is the new Sweet Tooth game going to replace the current Sweet Tooth 2 version? As far as Sweet Tooth Town goes, it’s a whole new game. Not going to replace Sweet Tooth 2. I do check the New& Coming soon page often.